Trek Date: A long time ago. 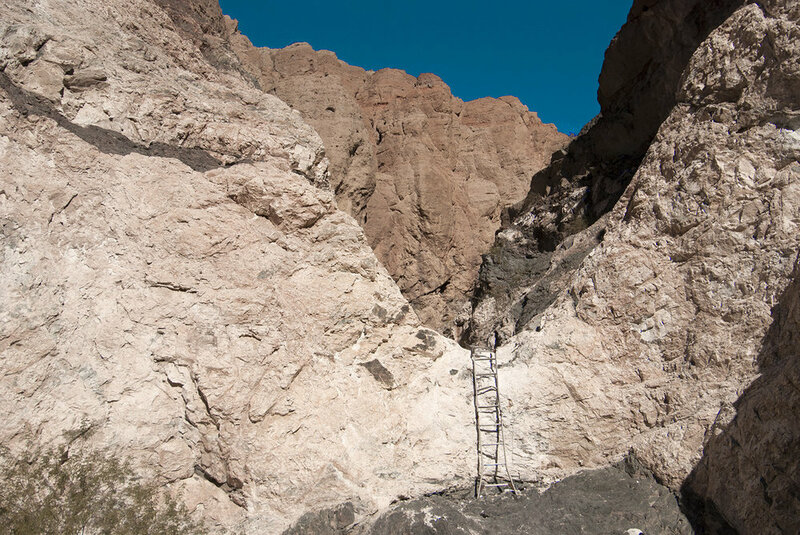 If you hike the Ladder Canyon Loop Trail, expect to travel between 5 and 6 miles round trip as you hike Painted Canyon, in the heart of the Mecca Hills. The canyon runs in a general north-south direction through some amazing colors and vegetation. The trail takes you up through some narrow cracks to the top of the canyons and then back down. It's definitely worth the trip. Lizards, snakes, cactus, Ocotillo, Smoke Trees and the occasional Bighorn sheep will be your companions. 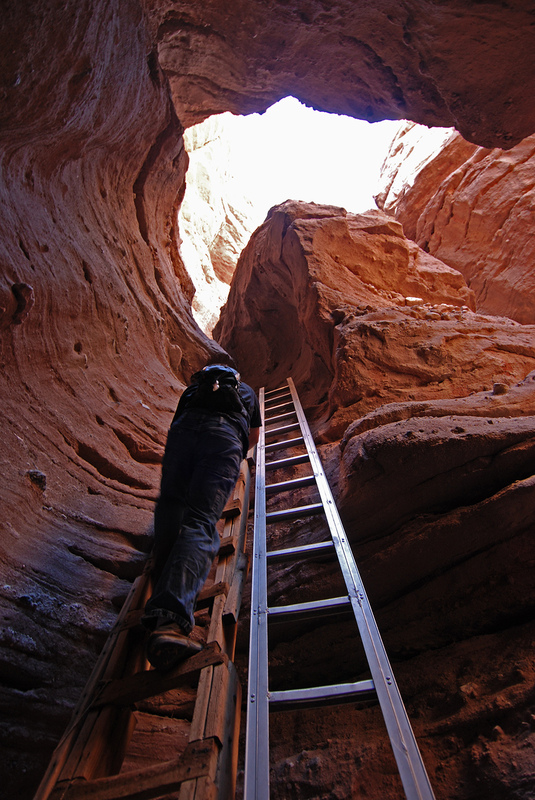 Pack plenty of water, be prepared to climb a bunch of ladders and see some amazing sites in a spectacular slot canyon. Follow along with the photos to get an idea of what you'll discover when you go out to see what you can find. It doesn't take long to get inbetween some towering rock walls. Rock arrows may or may not be in place to help you find the entrance to Ladder Canyon, but it's pretty hard to miss. Don't turn back, it's really not as tough as this photo makes it look. A little rock scrambling is required, but it's not that bad. Even Eric could do it. Some of the spots requiring ladders had newer ladders, some old, some both. There are some tight squeezes, twists and turns as you ascend the canyon. If you're looking for a great place to take your family or scout troop for a fun adventure, this is the place. It is deserty, so if you visit during the summer, bring LOTS of water. Once you get out of the canyon, there's little to no shade for most of the trail along the plateau. If you're thinking that looks like the Salton Sea out in the distance, you'd be right. 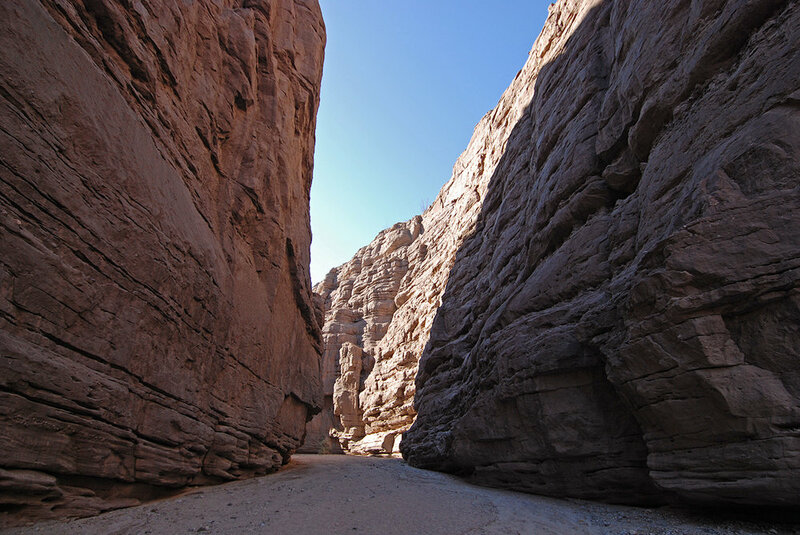 Hiking back down through these wide washes and towering walls is spectacular. There's some Scouts for perspective. All Scouts survived the outing. If any of these pictures inspire you to head out to Ladder Canyon, just do a bit of research, take what you need, and enjoy the day.